Some of my fondest memories when I was growing up were the times I spent with my family outdoors. The skills that I learned to be self-reliant have been some of the most valuable skills I have used in life. Here are just a few of the creative ideas that I have loved to use over the years. 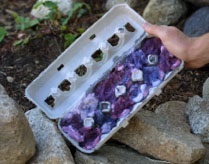 Egg Carton Fire Starter: If you want a sure way to start a fire, make some egg carton fire starters and keep them in your camp kit. When you go to start a fire you will not need any paper or kindling. When the wax is melted, pour it over the lint in the cups and let it cool and harden. To make a fire, just break off an egg carton cup, put it under the wood, and light. Keeping pans clean when cooking over campfire: If you are cooking in a pan over a campfire, the bottom of the pan will get black from the flames. In order to prevent that, rub liquid soap on the outside bottom of the pan before cooking. The soap will put a coat between and pan and the black scorching from the flame, and the black washes right off the pan. Boiling water in a paper cup: It is possible to boil water in a non-waxed paper cup without the cup igniting into flames. Pour water or milk into the cup. Cut a small round of aluminum foil and place it around the bottom lip of the cup. Set foil and cup on the hot coals. The foil protects the small lip on the bottom from burning. If flames rise against the top of the cup where liquid does not reach, the cup can burn. The liquid in the cup keeps the paper below it combustion point and it will heat without the cup burning. You can hard-cook eggs in a paper cup. It is also possible to heat a carton of milk if the carton is non-waxed. Open the milk carton top before heating. Paper plate holder: Paper plates are often flimsy. The best way to give them support is to purchase a Frisbee that is the same size as the paper plate. Put several layers of plates in the Frisbee and peel them off when you are finished with the meal. You'll then be set for the next meal.